Count us in for the river trip….do I hear banjos?? We’re just going to come visit for the day. Ringing rocks is now open for the season! Book now! Our name sake! The 128 acre park contains a field of boulders that have an unusual property. When the rocks are struck with a hammer or another rock, they make a ringing sound, similar to that of a metal pipe being struck. The park also features a waterfall and hiking trails. The 5,283 acre park boasts a variety of outdoor activities for the whole family, including hiking, biking, horseback riding, picnicking, swimming, boating, and fishing. Located in the beautiful village of Point Pleasant, PA, River Country offers kayaks, canoes, river rafts and the ever popular river tube for hours of fun on the Delaware River. Enjoy hours of fun tubing, rafting, kayaking, or canoeing on the Delaware river. Tohickon Creek flows through this 45 acre park, making it a scenic picnic and hiking area. The “High Rocks” section of the park features an outstanding view of Tohickon Creek and the 200ft sheer rock face is popular with experienced rock climbers. Hands-on fun for kids of all ages. Experience Sesame Street together with your kids through whirling rides, water slides, colorful shows, and furry friends. Dorney Park & Wildwater Kingdom has 200 acres of more than 100 rides, games, restaurants, and attractions for the entire family. Recently opened in May 2009, the Sands Casino Resort features 3,000 state-of-the-art slot machines and electronic table games, as well as a variety of entertainment and dining options. Visit the site where General George Washington and the Continental Army crossed the Delaware River on Christmas night 1776, which re-ignited the cause of freedom and gave new life to the American Revolution. There’s so much to discover in this magical land of crystal formations where the Lost River flows. Five picturesque cavern chambers feature an abundance of stalactites, stalagmites, and other crystal formations along with fluorescent minerals. The temperature in the caverns is a constant 52 degrees, so there’s no better place to escape the summer heat! The 72 acre estate features an 11,000 square foot castle and a 7,000 square foot wine cellar 30 feet underground. How is everyone getting a site already? I made a reservation but they haven’t told me which site. We were told what site we had when we booked. When I originally spoke to the campground, they were assigning site numbers to for the over 30′ campers first and then filling in the smaller campers. There are both size sites available within the same group of sites, you guys are on site R22. Hi this is my first time on the site.. I’m interested in this trip. what do I do to get signed up? Hi, Welcome! Super easy to join in. Contact the campground directly, tell them you are arriving with this group canvascampers, it helps if you know a couple site numbers in advance when you’re talking with them so they can let you know what’s available of them. Once you have your site, post it here and you’ll be added to the Rally list. Make sure you’re following this thread, because soon the rally coordinator will post the theme for the Saturday night potluck. Then just chime in with what you would like to bring. We’ll be coming up for the day, so we look forward to meeting you. Any questions, anytime, just let us know, happy to help! We are in. don’t know the site. They are doing Christmas in July the weekend we will be there. If you have kids with you, you can bring a small wrapped toy with their name on it (turn it in at check in) and Santa will deliver it to them. Ok what are the details about the tubing? Kayaking? Where are we going? Weather permitting, we are planning to tube on Saturday. 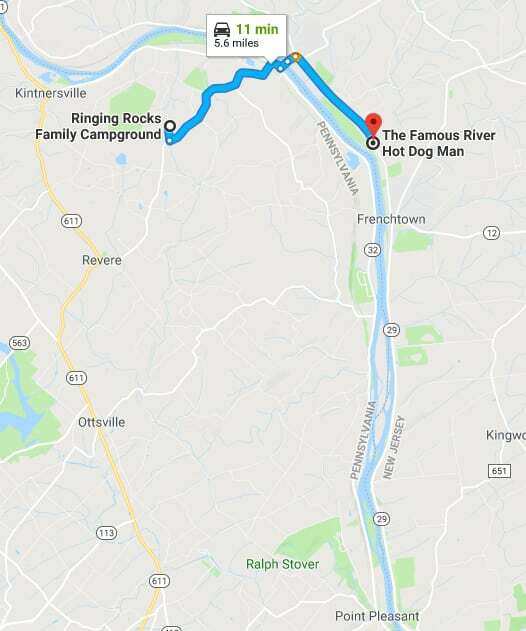 We are going to stage vehicles at the end and start at a park on the Delaware, New Jersey side. 5.6 miles, 11 minutes from the campground. Will this be through the tubing company or is it BYOT? Barb and I will be childless so we are bringing our Kayaks along with our tubes. So we will have extra tubes for anyone who needs them. We are tubing on our own in public water with several businesses. If you have a tube, we are tubing on our own. If you need a tube, you can rent one. The trips aren’t guided either way. Their business is tube rental and shuttle service. After going through some old paperwork, I came across a game we played at a 2011 rally. It is coming back! We will be playing a game at 5:30 on Saturday, 30 minutes before the potluck dinner. Speaking of potluck, what’s everyone bringing? We will be bringing a to be determined dessert. With the holiday theme in mind, I am thinking about bringing a spiral ham. A size that I can cook in a crock pot. Will also bring sandwich rolls. Are there any shopaholics interested in going to New Hope on Saturday, instead of floating down the river? Rusty and I are planning to float down the sidewalks of New Hope.